and paediatric first aid training courses, which focus on children and infants. You might wonder why there are separate courses for adults and children. The short answer is that in some key areas, the advice for children is different from that of adults. Therefore, for parents, child-minders, teachers, and anyone else who supervises children on a regular basis, it’s important to know these differences and the right response. Treating children and infants also poses different challenges. Children may be unable to describe how they feel or understand what is happening, and are much less likely to remain calm and follow instructions. Children are also prone to different illnesses and injuries than adults. Completing a Paediatric First Aid Training Course is a mandatory requirement for child-related NVQs. Where does first aid advice differ for adults and children? For adults, you should use two hands for chest compressions. With children over 1 years old, you should only use one hand, and for infants under 1 year, you must only use two fingers. 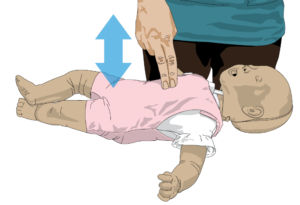 For adults, you should begin CPR with chest compressions, while for children and infants you should begin with five rescue breaths followed by compressions. 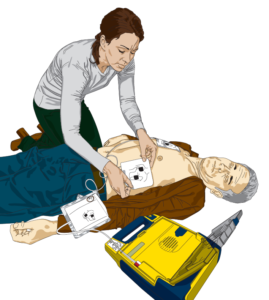 For adults, you can use any AED fitted with standard pads. For children under 8 years old, it is highly advised that you use special paediatric AED pads where available, which deliver a less powerful shock. If not available, you should still use adult pads. When using paediatric AED pads on small children aged 1-8, one pad should be placed in the centre of the child’s back, with the other one on the centre of their chest. For adults and older children, both pads go on the chest. The procedure for choking adults and children is very similar, but is very different for babies due to their much smaller size. Babies and young children are much more likely to choke on food or foreign objects than adults, making this a key part of a paediatric first aid course. Unlike adults, children under four years old have not fully developed the part of the brain that regulates body temperature. This means that when sick, their body temperature can rise rapidly, triggering febrile convulsions, which are a form of seizure. This is an issue specific to young children. Accidents and illnesses in the home are commonplace. However, despite being concerned for their children’s welfare, many parents lack either first aid supplies or training. This training could be life-saving. We recommend all expectant parents or parents with young children enrol on a first aid course! You can also buy a first aid for children booklet online here.